The end of 2011 is nearing ever closer and the upcoming festivities are being planned, but music enthusiasts all over Australia know that the end of one year brings the announcements of all the big musical festival line-ups. Gone are the days when Big Day Out used to rule the roost, the introduction of more and more pop, mainstream artists to BDO has left many rock fans stranded. That is until the Soundwave Festival was created to cause metal heads to flock from all over and get completely blown away by the awesomeness of their favourite tunes. Soundwave started in Perth in 2004, and spread to all the major cities in Australia by 2008, and in these years Soundwave has promised acts such as; Deftones, Good Charlotte, The Offspring, Iron Maiden, Nine Inch Nails, Alexisonfire, Paramore, Faith No More, Lamb of God, Alice in Chains, Slayer and Queens of the Stone Age, just to name a few. Sound similar to the old 90s BDO line-ups? With a mix of old school rock, heavy metal, new age screamo, alternative rock and pop – punk, Soundwave has picked up where other festivals have foolishly dropped off. So this is what previous line-ups have looked like, but what have they got in store for us in 2012? 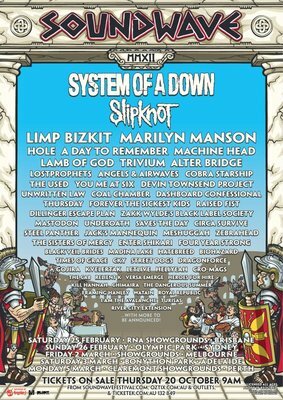 The first announcement of the 2012 Soundwave has left many like myself already set on buying tickets, and with only more acts to be announced and added, it looks like next year could be the best year ever for Soundwave. Headlining are newly reformed System of a Down, cringe- worthy SlipKnot, old-school rap metal artists Limp Bizkit, always psychotic Marilyn Manson and the one and only Hole. Are your eyes being pleasured by the words you are reading in front of you? Well your ears will be ready to explode, with over 60 acts already announced. Soundwave promises to be the place to be in 2012. For the full line-up refer to the Soundwave Festival website. I suggest that you support your Aussie bands such as Heroes for Hire, as they have made it on to such a prestigious line-up. Refer to venues and dates listed below, and make sure you stay tuned for the next announcements as they always promise at least a few more notable acts. The times and stages artists will be at during the day will be released closer to the event, so when it does print it out and circle the needs and hope to God that your favourites don't overlap. It is always a great day out and trying to get a large group together to go is always fun, pack heaps of sunscreen, lots of water and charge up those phone batteries. There are signing tents to get all your favourite merchandise signed by the bands that make your life that much better. The venue always has plenty of Police Officers and Security guards patrolling to keep the mischief in order, and normally they come equipped with the dog squad to keep out the unwanted drug culture that an event like this can sometimes attract. There is a bar for the over 18s, which is strictly monitored by Security, so while this an all ages event, there is alcohol to be consumed in certain areas. So I leave you with the following words, if 2012 is the last year we have on this Earth, why not spend some of it rocking out to some of the most epic bands to ever grace our fine, scorching shores? Why? To hear some of the best rock artists out today, and to have a great day out with the mates. Hole have pulled out of Soundwave 2012 due to Courtney Love's refusal to open for Limp Bizkit (mainly Fred Durst). Next announcement of acts on Wednesday 17th of October. http://www.killyourstereo.com/news/11681/soundwave-2012-releases-second-announcement/ ... all the bands announced in the second session... Support Sydney's Tonight Alive! Okay, that line-up looks so tempting that the ticket price is actually value for money. It’ll go off! The only thing is, on the website they said no moshing. At a rock festival, really? I wonder if they’re going to police that.